Heat from the shower drain is used to heat the water for the shower. This works because the shower water is a mix of hot (140F) water with cold (usually 60F) water. 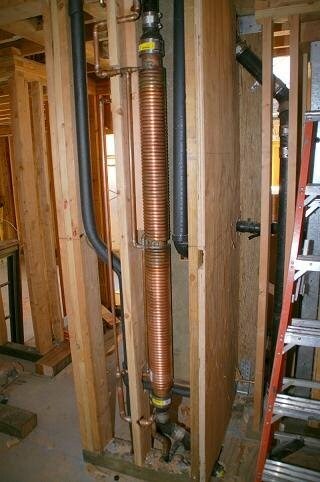 Heat recovery takes heat from the shower drain via a heat exchanger, and raises the cold water from 60F to ~ 75F. By using 75F instead of 60F 'cold' water in the shower mixing valve (a thermostatic valve is needed), the shower will draw less water from the water heater. It is estimatedthis will save 25% hot water, we have put sensors in place to measure the actual savings. See the preliminary data. The GFX heat exchanger was used, installed as pictured above. The claim is that around 30-40% less water is needed from the water heater. We will measure and see. 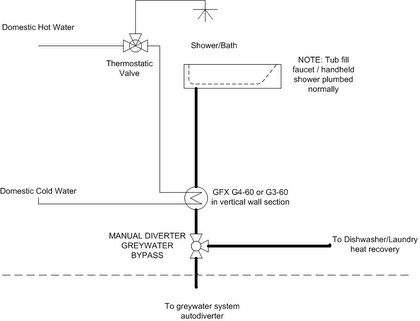 The plumbing diagram is shown below. Heat from laundry, kitchen sink and bathwater is not as immediately valuable as shower water, since the demand does not occur simultaneously with waste water release. This otherwise wasted heat can be used for heating water drawn into the waterheating tank.